In search of personalised vest tops? 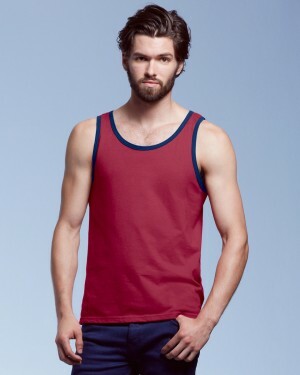 Our selection of ready-to-be-printed vests is probably one of the best and most extensive you’ll find online. Unsure about which one you want? Get in touch! Our friendly team of experts will be more than happy to help you. Personalised vest tops have moved on from when our mothers used to ask us if we had our vest on under our school shirt before we set out for school on those chilly autumn mornings. Same as personalised T-shirts, nowadays this is a fashion garment perfect for layering or doing sports. They are also used as promotional clothing to advertise the name of your team everywhere. Sleeveless garments go well with almost every printing technique. Let’s give embroidery to embroidered polo shirts, and screen printing and DTG printing to the cotton fabrics! Basically, the difference between these two is how to apply it because then the garment will look almost the same. Because they’re sleeveless, this garment is perfect as a base layer in cooler weather, and as a simple fashion garment when it’s warmer. Printsome stock a wide range of styles and colours for all your printing needs. Vest tops can be used for all kinds of sports and leisure activities including, running, cycling, dancing, aerobics, Zumba, Crossfit, and going to the gym. They are also great for team events such as triathlons, or races, and can be printed with events sponsors’ names, charities and team logos. Bulk T-shirt Printing is your best option in any case! We know it might sound a little sleazy from our part that printing in bulk is better. However, it is a win-win situation for everyone involved and that’s how we like to think because we are going to show you that there are also benefits for you as a customer: You save money because the more garments you order, the lower the price of each item. You also get consistent quality because they were all in the same production requirements. You save time because is just one order for all the garments you need. You are friendlier to the planet. Need more advice from this online T-shirt printing agency? That’s what we are here for! To really make the difference we decided to create the best customer service you can have, and we are doing it pretty well. Our team of printing experts is always happy to help you throughout all the process. Whether you need custom t-shirts, polo shirts, personalised hoodies, Printsome it’s your option! Are you in a hurry? With Printsome you have two delivery options. Express delivery: 2-4 days, or the Standard delivery: 5-10 days. If after this you still need more flexibility, just ask your account manager for it. We will always try to make things work for you! If this is what you are in search of, just get in touch! We will be happy to help you!